When it comes to waterproofing your home, especially when talking about interior waterproofing, a sump pump and backwater valve are absolute must-have technologies to not only re-direct water away from the foundation of your home, but also avoid the nasty situation in the event of a major storm when sewer waste backs up through the pipes of your home. Remember, we live in an age where municipal infrastructure has become dated, and is easily overwhelmed during the heavier rain storms we are seeing more and more now. Don’t leave things to chance. WHAT IS A SUMP PUMP AND WHY SHOULD I INSTALL ONE? More regular, and heavier, rainfall, means your basement is more at risk of flooding. Water pressure leads to foundation cracks. A rising water table in the event of a rain storm or snow melt means an increase in hydrostatic pressure on the basement floor, and that can lead to water leaks and flooding. There are three main features of the sump pump, a device that we will install that re-directs water away from the foundation of your home, to an area outside the home so it no longer presents a problem – a tank that holds the water that is drained from the weeping tile, a pump that pushes the water up and out of the basement, and a battery back-up system and alarm. Why install one? To protect your investment. Water leaks lead to mould, and that will eat away at the structure of your home. It’s also bad for your health – leading to nasal stuffiness, coughing or wheezing, throat and skin irritation. Mould can form in any area that stays wet because of flooding or leaks. There is nothing quite like the feeling of a dry basement and that’s where a sump pump can help.  Call Canada Waterproofers Markham for a free onsite waterproofing assessment of your home. The sump pump is installed inside the basement along the wall – as long as there is a place to discharge the water (so the water doesn’t flow back into the house). The crews at Canada Waterproofers Markham will excavate, remove and dispose of the soil, and install a water tank. This system consists of a separate pump that runs off a marine battery, so if there is a power failure or a primary pump failure, you are protected, since the back-up pump will automatically switch on. This gives you the peace of mind you need. The back-up device can continue to pump water out of your basement without the aid of main power for up to 24 hours. There also is an alarm, that automatically switches on when the battery pump kicks in, so you will know when the main pump is not functioning. Extra security like this is something we always recommend to our clients, if you are thinking about installing a sump pump in your home. This pump is powered by your water supply in your home – kind of like fighting fire with fire. Water turns the pump turbine, which then pumps water out of your basement. With this pump there is no time limit as to how long it will run. As long as your water supply is on this pump will work. You will need a minimum ¾” water supply line from the city coming in your house in order for the pump to work correctly. If you have the supply line, and it’s located close to your sump pump, then we feel this is the ideal way to go. It’s one of the most reliable pumps on the market. A backwater valve is a device that prevents outbound water from the home to re-enter through the home’s drain pipes. The valve prevents raw sewage from backing up into the home through toilets, sinks and showers – a true nightmare scenario – by closing automatically. As the weather conditions change, municipalities and insurance companies are advising homeowners to install these devices, especially in older homes. They are an absolute must. This takes just one day. Our crew will conduct a camera inspection of your home’s sewer system to determine the best place to install the valve. A crew from Canada Waterproofers Markham will excavate where the sewage connection leaves the house (normally in the front of the house), inside or outside the foundation wall. The building code stipulates that the valve has to be within a maximum of three feet from the front wall. You cannot have a Y Pipe connected within three feet behind the valve, or you risk having the sewage back up into the house. Install the city-approved BWV with down-stream, clean-out access in the front of the valve. Have the valve inspected by the city. The Canada Waterproofers Markham crew will support the pipework with gravel and then back-fill and compact the ground, followed by inside concrete finish and outside gravel finish. Clean-up is the last step. Canada Waterproofers Markham is your one-stop for all things home waterproofing and plumbing. Call us for a free assessment of your home.